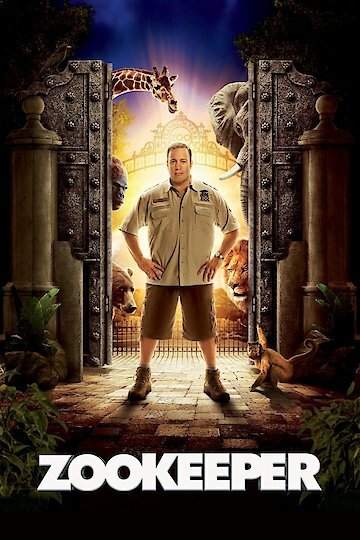 This outrageous comedy stars the hilarious, Kevin James, as the zookeeper of the Franklin Park Zoo. James is an all around good guy, great friend and caretaker to the animals, but he's not so lucky when it comes to women. James tends to become awkward and winds up making a fool of himself. If only he could be as comfortable with women as he is with the animals he cares for. When the woman of his dreams leaves him, he feels compelled to win her back the only way he knows how. He must leave his job at the zoo and securing a more appropriate employment. The animals find out about his plan to leave and have to stop him. They decide it's time to let him know about their secret. The animals can talk. The animals figure that if they combine everything they know about charming a woman and teach it to James, then maybe he'll stay. The interaction between James and the animals is very entertaining and certain to make you laugh. James is urged to make his dream girl jealous by dating an attractive co-worker. James awkwardly invites the woman out for an incredible evening of mishaps and laughs and turns out having a great time. Over time James builds relationships with several of the zoo's inhabitants and begins having feelings for his co-worker. The entire family can watch as James marks his territory, takes a gorilla out to dinner, and carries on conversations with bears. Watch and listen to the curious creatures that call Franklin Park their home. Learn about animals courting rituals and compare them to humans. Keep your senses keen to detect the voices of some favorite stars like: Adam Sandler, Cher, Sylvester Stallone, Maya Rudolph, Jon Favreau and Judd Apatow. The extreme animal antics will leave you laughing. This romantic comedy offers courtship advice, love lessons and the true meaning of friendship from the voices of zoo animals. Zookeeper is currently available to watch free on Pluto TV and stream, download, buy on demand at Amazon, Vudu, Google Play, iTunes, YouTube VOD online.